If you see something you like, or plan to buy in the future, it's time to hit the "register" button. After registration, it would lead you back to the main page and I noticed something kinda cute. So apparently if you login to their site once everyday you will receive free 200 points. But of course you got to login for a continuous of 10 days. They have Nature's Republic Aloe Vera Soothing Gel! Oh sorry got distracted for a while, but here's just another picture of some of the products they have. You really have to visit their site to browse around because they have many products. I noticed this mask icon and decided to click on it to see the difference between that icon and the "Masks" at the tab and that led me to this. Hermo has a Mask Combination Box! This means on this page, you may choose the masks you want, and it has to be 10 pieces per box. Visit the page to see what masks available, but here's just a print shot of roughly what they have. The prices for the masks are also slightly cheaper. Click on the "add new address" and fill in your details. 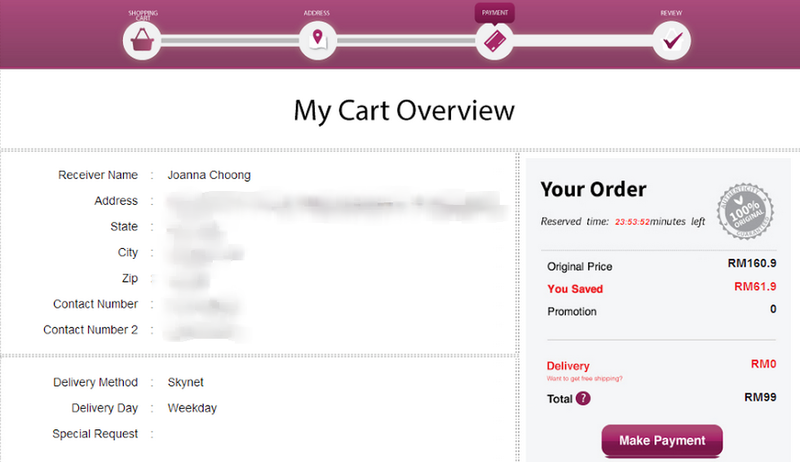 What I really like about Hermo.my is that I can have a special request on my order. :) So I chose weekday because I gave my office address, and selected Pos Laju for courier. Continue scrolling down and you can choose which method you'd like for payment, there are icons of banks. I chose to make payment on my own and personally contact Hermo after. So yes definitely do check www.hermo.com.my and shop! If you don't find anything you like at the moment do not be disappointed because they are somewhat still quite new. There will definitely be more products to come, I look forward to more new stuff from them too!